KNOXVILLE, TN--(Marketwired - April 01, 2015) - Pilot Flying J is getting a jump on summer driving season with the debut of its new "PhilMor" travel coffee mug and refill program. Starting today, professional drivers, traveling families and motorists who love the coffee known as "best on the interstate" can pick up a new on-the-road companion in PhilMor, which will fuel smart savings every time they refill the mug. The PhilMor branded travel mugs come in 20- and 24-ounce sizes and are available for $3.49 with a MyRewards card. 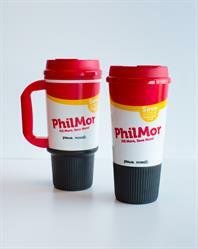 However, during the month of April, customers can purchase a PhilMor mug for just $1.99. The first beverage with the purchase of a PhilMor mug is free, and refills are $1.19 with a loyalty card. Customers can receive up to a 60-cent discount on refills. "Pilot Flying J serves more than 50 million cups of coffee per year and that kind of loyalty deserves to be rewarded," said Laura Palenkas, Vice President Marketing and Merchandising for Pilot Flying J. "PhilMor was created to provide our customers with a fun way to save money while filling up on our coffee and a variety of other favorite beverages. And who doesn't want a buddy named PhilMor along for the ride?" To introduce customers to the money-saving power of PhilMor, Pilot Flying J will offer in-store promotions and website-exclusive promotions for mug owners and MyRewards card members. These offers include free snacks, refills for only 50 cents with purchase of a breakfast sandwich, and free candy bars with the purchase of a refill, along with other offers designed to surprise-and-delight customers throughout the month. For more information about PhilMor and to check out weekly specials and offerings throughout 2015, visit MyPhilMor.com. Pilot Flying J, the largest operator of travel centers and travel plazas in North America, is committed to making life better for professional drivers. Headquartered in Knoxville, Tenn., Pilot Flying J has more than 650 retail locations. The Pilot Flying J network provides drivers with access to more than 65,000 parking spaces for trucks, 4,400 showers and more than 4,500 diesel lanes offering DEF at the pump. Pilot Flying J, along with its subsidiaries, employs more than 24,000 people. Pilot Flying J is currently ranked No. 7 on Forbes' list of America's Largest Private Companies. Visit www.pilotflyingj.com for more information.